PARIS, May 27 2014 (IPS) - As acclaimed writers arrived in France this week for an international poetry festival, many expressed shock at finding that 25 percent of the country’s vote had gone to a far-right party in elections for the European Parliament. “I’m afraid for Europe, I’m afraid of what’s going on here now,” said Joël Des Rosiers, an award-winning Haitian-born poet and psychiatrist, whose family fled François Duvalier’s dictatorship in the 1960s to take refuge in Canada. “It’s as if Europe is losing its capacity for universality,” he told IPS. France’s anti-immigration party, the Front National (FN), came first in last Sunday’s election, beating the centre-right Union for a Popular Movement (UMP) and pushing the governing Socialist Party into third place. While the FN celebrated, Des Rosiers and other writers from Haiti, Guyana, Martinique and elsewhere came to Paris to take part in a week-long festival organised by the Biennale Internationale des Poètes en Val-de-Marne, a French cultural association that supports contemporary poetry and especially writing that has a strong humanistic element. 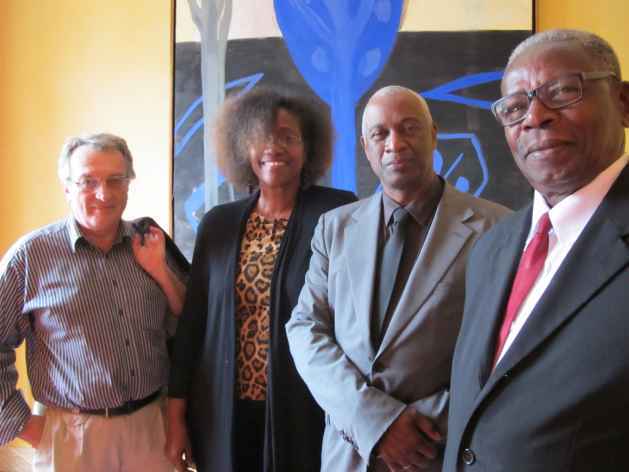 Although not a political movement, the Biennale promotes diversity in literature, and this year it has organised a Festival of Caribbean Poets (Poètes des Caraïbes) that runs until June 1. Des Rosiers, who did part of his university studies in Strasbourg, the main seat of the European Parliament, said writers had a role to play in pushing back the tide of nationalism in Europe and especially in France. “As writers, we are here to explain to Europeans who can still listen that we are part of you. I’m a person of African origin who speaks French because of you. You have a responsibility for that. This is not to make anyone feel guilty, but we have a history that is common to all of us,” he said. Delia Blanco, a poet and professor of art and comparative Caribbean Literature in the Dominican Republic, also expressed stupefaction at the vote, especially for a continent that has “seen two world wars”. In response to a question about anti-immigrant or racist movements in the Caribbean itself, concerning Haitians for instance, Blanco said that “racism comes from ignorance”. “When people take the time to know others, it’s a different thing,” she said, adding that there was also a difference between the actions of people and those of the state. “Maybe being a poet is to believe in illusion, but we have an ethic and poetic vision of unity,” Blanco told IPS. France is not the only country that voted for radical parties in the elections. The United Kingdom handed victory to the Euro-sceptic U.K. Independence party (UKIP), with 27 percent of the vote, while the Labour Party received around 25 percent, and the Conservatives (part of the coalition government) got just under 24 percent. In Greece, it was the far-left that scored highly, as Alexis Tsipras’ SYRIZA coalition grouping garnered over 26 percent, in comparison to the 10 percent for the neo-Nazi Golden Dawn party, which came in third. But the result in France, a country that sees itself as an icon of equality and fraternity, sent shudders through the main traditional parties. In response to the vote, President François Hollande said that people had to be listened to but that the “worst” thing would be renounce France’s “values”. Promising reform and calling for a “reorientation” of the 28-country European Union to become transparent and effective, he said the future was not in closing doors and “rejecting” others but in working to boost the economy. Hollande and other leaders were scheduled to meet Tuesday in Brussels and expected to discuss ways to address European voters’ anger and dissatisfaction with the status quo. Even with the low turnout overall, the elections for the Parliament had been closely watched because of the legislative body’s expanding powers. MEPs, who shuttle between Brussels and Strasbourg, have been making their voices increasingly heard on a variety of topics, ranging from international trade agreements to health-care policies. They will influence EU legislation during their mandate, and will also help to determine who becomes chief of the European Commission, the Union’s executive branch. These are some of the reasons that Front National head Marine Le Pen heightened her campaign, using the familiar themes of less globalisation and fewer immigrants, in the run-up to the vote. As with the French national elections two years ago, she tried to distance her party from its more radical past, but her father Jean-Marie Le Pen showed the dark side of the Front in a speech ahead of the polls. At a reception in the southern town of Marseille, Le Pen suggested that the deadly Ebola virus could “solve” population growth in the world and thus the “immigration problem” in Europe, according to media reports. He expressed fears that France was facing a “migratory invasion” that was just beginning.